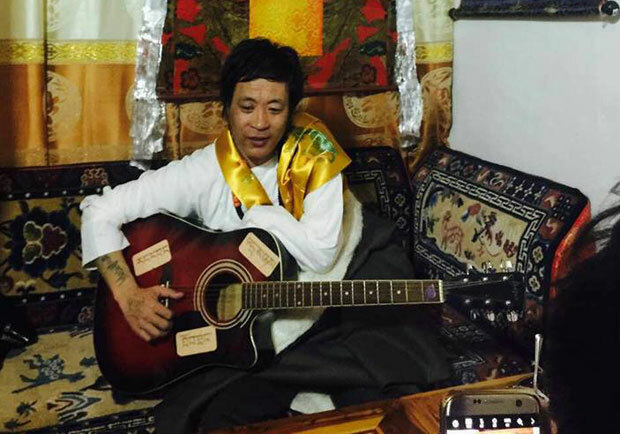 (TibetanReview.net, Feb19, 2017) – A popular Tibetan singer released from jail for singing politically incorrect songs has been released after completing his four-year term but has been placed under tight restrictions at his home in Amchok township of Marthang (Chinese: Hongyuan) county of Ngaba Prefecture, Sichuan Province, reported the Tibetan Service of Radio Free Asia (RFA, Washington) Feb 17. Amchok Phuljung was released from Sichuan’s Mianyang prison on Feb 2 but is barred from singing at public concerts or from leaving his home town. Following his release, Chinese police escorted him to his home town while preventing receptions and other displays of public welcome for him along the way, the report said. Nevertheless, when he arrived home in the evening, the local Tibetans greeted him with songs and offerings of traditional ceremonial scarves. “Over the next two days, at least a thousand local Tibetans and residents of nearby areas, including Tibetan writers and singers, came to welcome him and celebrate his release,” the report quoted a local source as saying, speaking on condition of anonymity. He is also forbidden to leave Amchok township and must obtain prior permission from the local authorities if he has any special reason to take a trip. Phuljung, a physically challenged singer, had written and recorded songs which described the hardships of Tibetans living under Chinese rule. He was detained on Aug 3, 2012 from the prefectural capital of Barkham (Maerkang) County after a short period of being in hiding following the release of an album which praised Tibet’s exiled spiritual leader the Dalai Lama and the elected exile political leader Lobsang Sangay. He was tried and sentenced in secret.